Ferrule crimping pliers are specialized hand tools that crimp different sizes and types of of ferrules, terminals, and connectors (Source). These crimping tools will solderlessly conjoin two pieces of metal by manipulating one or both of them in a way that makes them bind to one another (Source). The result of this 'conjoining' is referred to as a 'crimp'. One of the more common applications is affixing a connector to the end of a cable (Source). This quadrilateral ferrule crimping plier is built from nylon & copper with a 0.25~6.0 mm² capacity and AWG: 23 ~10. Reviewers say that they've performed hundreds of of differently sized crimps without any malfunctions- always tight. It's advised that you should buy quality, as opposed to cheap, terminals to ensure a solid seal. Unfortunately, they don't ship with instructions, so you'll have to play around a bit at first to get a crimping process down. Buyers we spoke with that the best method is to align the terminal/barrel with its hole and then crimp half-way, readjust your grip, and complete it with a tight hold for several seconds. You'll also be able to use the included ratcheting action to hold or readjust your grip. This crimper plier kit offered by GOCHANGE is a good option for someone who needs a quadrilateral ferrule crimper plier with multiple connectors for electrical repairs around the home or workshop. Users love the effectiveness and quality of this crimper kit, but some do complain about the fact that the package doesn’t come with instructions. This product features a handy assortment of terminals and connectors and it includes a crimper and stripper tool which makes it great for quick electrical repairs. The set comes with all you need to make electrical repairs. The package includes 800 insulated terminals and connectors in the most commonly used sizes. 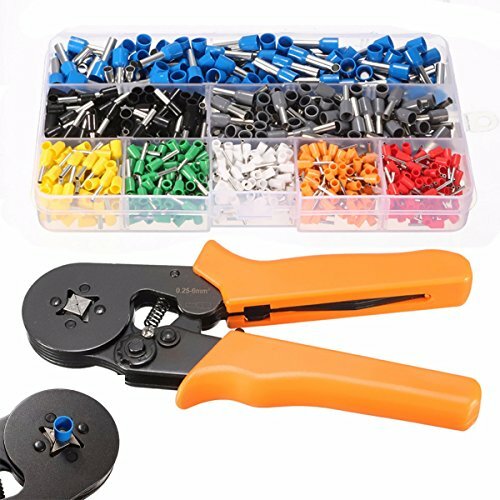 This crimp tool kit seems like a good choice if you are looking fora ferrule crimper set with multiple connectors. The general user consensus concerning the GOCHANGE ferrule crimper kit is that it is of extremely good quality and is a reliable solution to wiring with screw terminals.One happy purchaser shares that this set is just as good as some more expensive products, stating that all the connections are always nice and tight. However, one buyer complains about the lack of any instructions which is why it takes a while to get a good technique down. This wire crimper with waterproof connectors offered by Sokos is a good option if you are looking for a ferrule crimping set. Users love the effectiveness and sturdiness of the tools, and their only complaint so far regards the lack of any instructions. 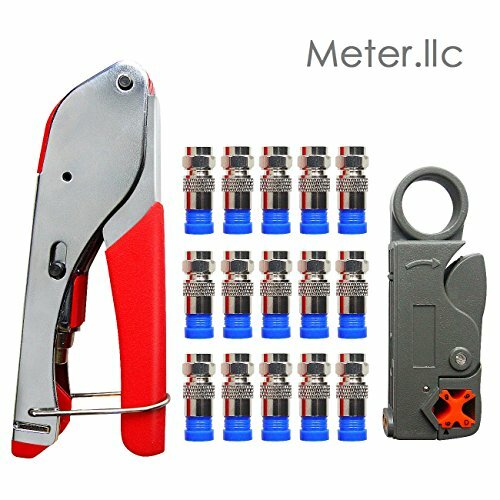 This product features one crimping tool, one coax cable stripper and 20 F compression connectors. The set is made of high-hardness precision materials and is durable, lightweight and easy to carry. This wire crimping set might be a good choice for an electrician who needs a handy, portable kit for getting the cable connections right. So far users have only good things to say about the Sokos ferrule crimping kit.What they praise is the efficiency of the tool, as well as how robust and sturdy it is made. One user says that both the stripper and the crimper work great and that you don’t have to use much force to get the connector on. The only thing online reviewers suggest is adding a brief instruction sheet for both the stripper and the crimper. 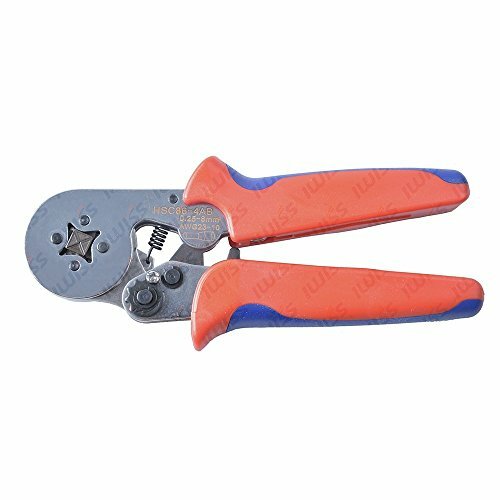 This self-adjustable wire crimper plier offered by Signstek is a solid option for those who need a ferrule crimper for 0.25-6.0mm2 cable end-sleeves. Users love the effectiveness and the price of this crimper plier, but one does complain about receiving a different brand without any notice. This product is a self-adjustable ratcheting ferrule for 23-10 AWG ferrules (similar to 0.25 – 6 mm² cable end-sleeves). The tool has a hexagonal crimp profile with six serrated crimp surfaces. When crimping tightly, the gripping force transfers to all the section of a crimping terminal.If you are looking fora portable and compact crimping tool, this might be a good option. In general, users have a highly favorable opinion of this Signstekferrule crimper and they state that it works well, even with the smallest sizes of wires. One happy purchaser says that by choosing this self-adjusting tool you get a great alternative to the over-priced competition. Another one shares that it makes great crimps easily, putting a more round crimp, and that it is better for smaller wires. However,one purchaser complains that he received a different brand without being contacted by the seller. If you are looking for a top-rated ferrule crimper, you might want to consider this crimper plier offered by Iwiss. Users like that this crimping tool is effective and cheap, though one buyer expresses his concerns regarding its quality and durability. This product features a quadrilateral crimp profile with four serrated crimp surfaces. 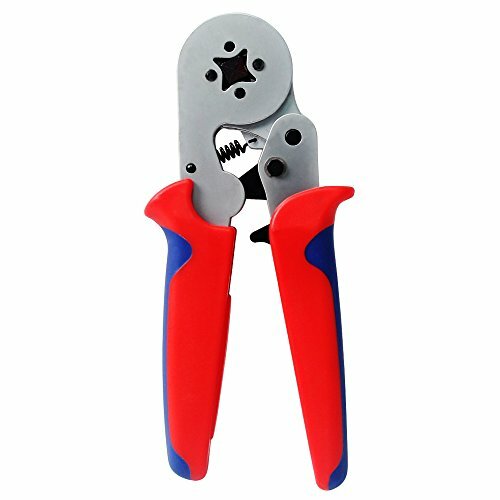 It is a self-adjustable ratcheting crimping tool for 23-10 AWG ferrules (cable end-sleeves). This wiring tool could be a good choice if you want a light-weight HSC8 6-4 crimper plier. In general, buyers say that this is a good crimper plier for the price, which makes a nice tight crimp and if necessary can be adjusted. One online reviewer shares that the square shape is perfect to get under terminals and that it performs much better than the 6-sided ones. However, one buyers, who is an industrial service tech, doubts that this tool will be long-lasting.He says that having been made in China, some irregularities in Q.C. can be expected, and thus advises getting a more expensive but reliable German brand that will last for years. 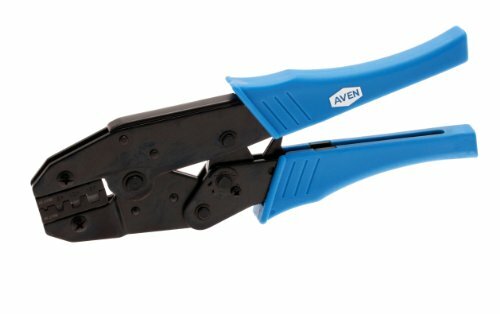 If you are looking for a ferrule crimper, you might want to consider this12-22 AWG crimping tool for wire ferrules offered by Aven. Users love the quality and reliability of this crimping tool and so far have no complaints. This product has a built-in ratchet which ensures a complete crimp every time. It features a safety release that allows you to stop a faulty crimp before the crimping cycle is complete. All you need for changing dies is a screwdriver. The Aven crimping tool is made of steel with molded plastic handles. If you are looking for a ferrule crimper with replaceable dies, this might be a solid option. So far none of the purchasers complained about the received product. Users recommend this ferrule crimper for it is a high-quality tool, solidly built and much cheaper than many other crimpers. As they say, it gets the job done great and is dependable. Crimping is commonly employed in metal working scenarios. Crimping is frequently utilized to fix bullets within their cartridge cases, for quick but enduring electrical connections, locking down covers on metallic food cans, and lots of additional uses. Since it can be a cold-working method, crimping may also be used to create a powerful connection between your workpiece and a non-metallic element. The first crimper plier we took a look at it is built by GoChange- it's indicated for electricians use, capable of dealing with connectors and terminals and performing electrical repairs. It's marketed as a comprehensive toolkit for performing solderless electrical repairs in professional work settings as well as in the home by DIY types. Reading through the promotional material, this particular ferrule crimper features an ergonomic handle, ratchet and lever action construction, four-pin crimp ability for quadrangular crimping, and a quick releasing safety lock. 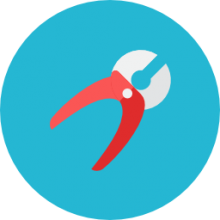 Buyers tell us that these dedicated crimping pliers are better than the ones that come with the wire strippers and cutters- they have proven to be a durable option that provides strong ratcheting action for clean and tight terminal crimps. Experienced electricians advised refraining from purchasing cheap terminals as this will affect the quality of crimping. The second cable crimper we examined is produced by Sokos. This steel option is intended for cables and arrives pre-calibrated for enhanced ease of use particularly on home theater systems, security systems, satellite TV and CATV. As a combination of wire stripper and battery cable crimper, buyers applaud how dynamic it is, saying it doesn't require much force to easily load the connector on. One cable repair person said that this simple pair of coaxial wire crimpers was a big help- enabling him to get his cable connections installed tightly and correctly. Because you can adjust the stripper, different sized cable is not too difficult to work with. The third wire crimper tire we examine is produced by Signstek. This ratcheting crimping tool features a hexagonal crimp profile with serrated services designed for portable use because of its small size. Buyers say that it is a solid pair of wire crimpers that works on small sizes providing quality crimps. The one criticism is it that because the handles don't begin ratcheting until they've quit something in their jaws, the tool often times is splayed open in tool bags when not in use. The fourth portable ferrule crimper we assessed is the handheld terminal hexagonal crimping tool by IWISS Tools. It's marketed as a lightweight option that supplies tight crimps with a powerful gripping force for crimping the terminal. The last option we examined is the Aven crimping tool. This wire ferrule crimper comes in various configurations for dealing with connectors that are 2.5 to 5 mm, working with wire ferrules that are 12 to 22 AWG as well as ferrules that are 6 to 10 AWG. Because of its integrated ratchet, you'll be able to determine the best pressure to create a complete crimp.